KRASNODAR, September 10. /TASS/. An ancient Greek altar untypical of Greek colonies on the Black Sea coast has been unearthed at the site of the antique city of Phanagoria on the Taman Peninsula in Russia's southern Krasnodar Territory, Vladimir Kuznetsov, who leads the Phanagoria archaeological expedition, told TASS on Monday. "The complex is dated back to the mid-6th century B.C., or the period when Phanagoria was founded," he said. "This rarest find is one of the oldest and most unique ancient Greek sanctuaries in Russia. As far as I know, such complexes have not been found anywhere else on the Black Sea coast. Moreover, they are quite rare for the Mediterranean region in general," he said. "The layout of this altar is absolutely unparalleled - there have been found no other similar altars with so highly specific elements." The clay-brick building was entrenched in the natural soil layer to a depth of two meters. A stairway leading from the vault ended in a small platform in front of a rectangular altar made of bricks. An 80 cm diameter bowl was placed at the edge of the altar and a deep pit was dug near it, with the altar’s surface and the pit’s verge showing traces of fire and ash. "The complex requires serious study and our task is to try to understand how this structure functioned," Kuztensov said, adding that archaeologists believe the building used to serve as a sanctuary dedicated to gods associated with the underworld. According to archaeologists, the altar was used to place a sacrifice on it, with the blood trickled to the bowl so that it would not be sprinkled on the altar. 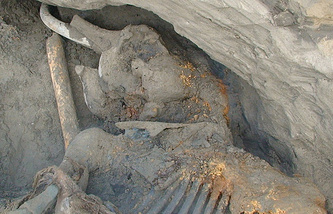 The pit, judging by the bone finds, was used to dispose of flesh. The ancient city of Phanagoria was founded on the Taman Peninsula in the mid-6th century B.C. by the Greeks. For a long time, it was one of the two capitals of the ancient Kingdom of Bosporus (beginning from the 5th century B.C. ), the most ancient state in the territory of today's Russia. The Greeks were driven out of the Taman Peninsula by the bellicose Hun tribes in the 4th century A.D.
Archaeological excavations at the site have been conducted since the 19th century. Currently, excavations are sponsored by Volnoye Delo Fund run by businessman Oleg Deripaska. The fund also financed the establishment of a research and culture center on the Taman Peninsula in 2012.